“Baseball Tournament on the Ellipse,” Histories of the National Mall, accessed April 22, 2019, http://mallhistory.org/items/show/359. In August 1865 the Washington Nationals Baseball Club invited the Philadelphia Athletics and the Brooklyn Atlantics to come and play in what was billed as a tournament. The Nationals constructed stands for spectators on their home turf just south of the White House, the area we now call the Ellipse. Over 10,000 people came to watch the games, even with an admission fee of $1. 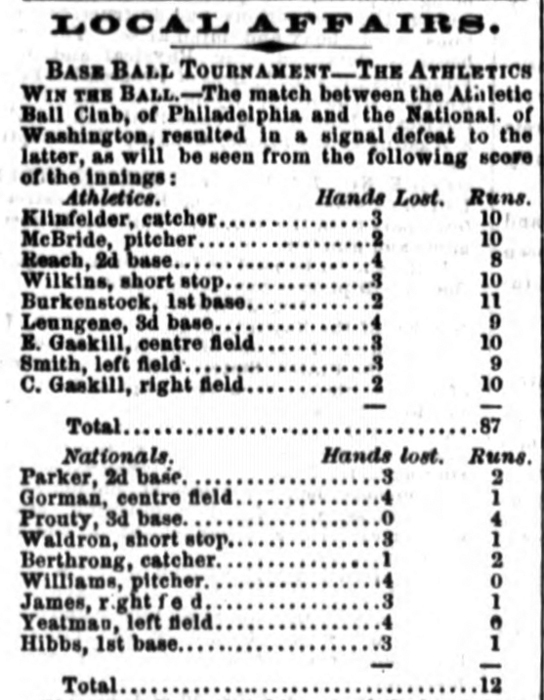 The Nationals faced the Athletics on August 28 and the Atlantics on the 29th, losing both games. The two out of town teams did not play each other. Daily National Republican, August 29, 1865, Second Edition. View original.